The robots revolution is here and they are taking many jobs away from humans. But not to worry, says Yoram Yaakobi, head of the Microsoft Israel R&D center. It’s a job that wasn’t possible before the era of big data, and would be impossible to do without robotics. It’s likely to be in high demand in the coming years, as the amount of data that is collected and needs to be stored explodes as a result of the spread of Internet of Things technology, said Yaakobi. Yaakobi was speaking at Microsoft’s ThinkNext event last week, where the company shows off its best and brightest new technologies, many developed in Israel. Robots are one of the issues that give many people pause about technological progress. Just as previous industrial and digital revolutions hollowed out whole industries, from farming to clothes manufacturing, so the robot revolution will automate many of the service jobs that are currently the backbone of employment in the West today. Already, said Yaakobi, the change has profoundly affected workers in “consumer facing” occupations, like bank tellers – many of whom have been replaced by enhanced automatic teller machines, which today do much more than just accept deposits and spit out cash. And there’s much more on the way. According to the World Economic Forum (WEF), robots will “rob” the economy of 7.1 million more jobs in the next four years, while at the same time creating 2 million more, for a net loss of some 5 million positions. It’s all part of the “the Fourth Industrial Revolution, which is interacting with other socioeconomic and demographic factors to create a perfect storm of business model change in all industries, resulting in major disruptions to labor markets. New categories of jobs will emerge, partly or wholly displacing others. The skill sets required in both old and new occupations will change in most industries and transform how and where people work,” said the WEF. One answer that’s feasible for a tech economy like Israel’s, at least, is to become a leader in robotics technology, thus maximizing the benefits to the economy of the robot revolution and maximizing the number of jobs in the economy. 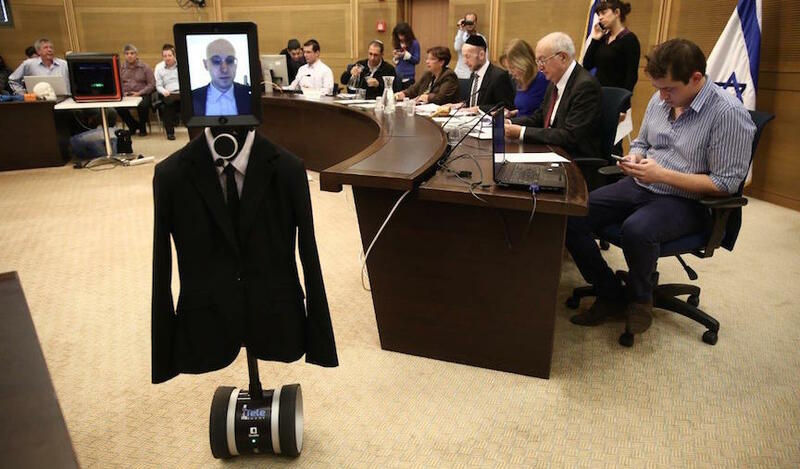 The theme of government responsibility was also on the agenda at a meeting of the Knesset Science Committee, which recently “hosted” a robot during a discussion on the changes Israel can expect in the robot era. Some Knesset members, such as committee chairman Uri Maklev, see the robotic revolution as a positive thing. “Robot technology is one of the most important technologies being developed,” said Maklev after the robot (which consisted of a computer mounted on a suit of clothes) made a text-to-voice speech about the future of robot technology. What will happen to those other four workers? They will have to be trained for some other occupation, said Maklev. But what kind of work could nurses aides, food service workers, and other relatively low-skilled service personnel be trained for? Several MKs, including Aliza Lavie and Manuel Trachtenberg, called on the government to “take control” of the robot revolution, and offer intensive retraining options to displaced workers, as well as advanced technology training to students. But according to the robot – who turned out to be Dr. Roey Tzezana, Futures Researcher at the Yuval Ne’emanWorkshop, Tel Aviv University (the robot voiced his comments and showed his image on a screen), there’s probably little society can do to minimize the loss of jobs. As many jobs that are lost will be created, said Yaakobi – and there will be plenty of opportunities for individuals who are flexible and can adjust to the changes in the economy and technology. The problem is what will replace those jobs taken over by robots. But thanks to new technologies like big data, IoT, augmented and virtual reality – and robots themselves – there will be plenty of new jobs to replace the old ones, according to Frey. A former IBM engineer and author, he has become one of the leading voices offering reassurance on how the future will play out. Another good example of a future job that simply does not exist now is Augmented Reality Architect. “Virtual and augmented reality applications and devices are going to be standard in most homes and offices in the coming years, and someone is going to have to supply the scenarios for the applications to be used with those devices,” said Yaakobi. Then there’s Yaakobi’s favorite – Big Data Deep Diver. “Already, we at Microsoft are experimenting with storing big data servers underwater, where the ocean water cools down the temperature of the server. It makes sense, as it obviates the need to use electricity to cool down a data center with air conditioning. But what happens when something goes wrong with the communications with that server – when a technician has to go down with tools or a software update that needs to be applied manually, or when there is a security breach? “For that you need two skill sets – engineering and scuba diving. The diver will need to go underwater and use robotic tools to repair hardware, or to reach components inside the server in order to add software modules.,” said Yaakobi. As big data storage grows at an exponential rate, thanks to the huge volume of data that IoT devices will collect, the number of underwater servers will grow sharply – as will demand for scuba-diving engineers. “Then there are time hackers,” said Yaakobi. “I don’t know what that is, but if it gives me more time to do stuff, then I need it.” (According to Frey, “If we think cyber terrorists are a pain, it will seem like nothing compared to devious jerry-riggers who start manipulating the time fabric of our lives”). Frey’s list includes those, and many more – from the more obvious (Crypto Currency Bankers, Regulators, and Lawyers; Automated Traffic Architects and Engineers for Driverless Vehicles) to the more esoteric (Bio-Meat Factory Engineers, Extinction Revivalists), from the sublime (“Super Baby” Psychologists, Failure Point Assessors for big data and IoT systems) to the currently-seemingly ridiculous (Plant Psychologists & Plant Therapists, Clone Ranchers).